Call Forever Marge's Floral Design... The place where flowers are uniquely designed and affordably priced. Forever Marges will take your special requests and create custom floral designs personalized especially for you. 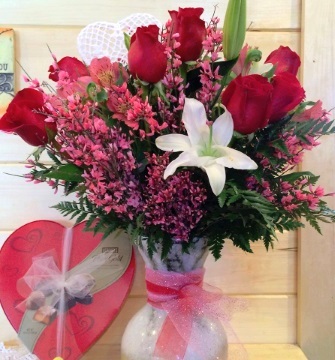 We're a local Iron River, Wisconsin florist with a lovely variety of fresh flowers and creative gift ideas to suit any style or budget. It is our pleasure to assist you with any local, as well as worldwide deliveries and remember that corporate accounts are always welcome. For your convenience, we offer daily floral delivery to local funeral homes and hospitals. We hope you enjoy your online shopping experience with secure 24-hour ordering right at your fingertips. If preferred, you may call us to place orders direct at 715-372-2837. All Occasion House Plants & Gift Ideas ~ Shop from our Green Plants, Blooming Plants and Dish Gardens for a gift that adds life to any room or office. We also offer a variety of other choices… Fruit Baskets, Gourmet Baskets, Bath & Body Gift Baskets, Baby Gifts, Candy & Chocolates, Gifts, Greeting Cards, Home Décor, Scented Candles, Silk Flower Arrangements, Plush Stuffed Animals, Balloons, Unique Custom Crafts by Beede and more! Wedding Flowers & Flowers for Special Events ~ Call us at 715-372-2837 to schedule a consultation. We would love to help you start planning flowers for your dream wedding or any special event – large or small. Our talented designers create bouquets, flower arrangements and on-site decorations with each client's individual style and budget in mind. Don't forget... We're also your local source for Jim’s Formal Wear tuxedo rentals. Call or stop by for more details! Sympathy Arrangements & Funeral Flowers ~ Specializing in custom funeral work, we personalize sprays and arrangements in an effort to make beautiful lasting memories that are uplifting and comforting for the bereaved. You can always depend on us when you need to send flowers for the funeral of a friend or loved one. We will design and deliver a funeral arrangement that conveys your feelings of sympathy and serves as a lovely tribute to the deceased. At Forever Marge's Floral Design, we are very highly-focused on customer service and we believe if you satisfy customers the first time, they will come back. Thank you for visiting our website with flowers delivered fresh from your local Iron River, WI flower shop and convenient online ordering 24 hours a day!